During the holidays it is easy to get distracted during cooking, or put off cleaning up the kitchen after a good meal. It is important to make sure that foods are kept at appropriate temperatures reduce bacteria growth. After the meal, immediately refrigerate leftovers. Do not allow foods to sit for several hours at room temperature. This will encourage the growth of bacteria. Do not cool leftovers on the kitchen counter. It is tempting to leave leftovers sitting on the counter for other members to take home with them. Store those leftovers in the refrigerator until they are ready to leave. It is important to keep your kitchen clean as you are working. A clean kitchen will greatly reduce the possibility of food contamination. Towels and wash cloths should be kept clean and changed often. Sponges are common in the kitchen, but they are known for harboring bacteria. Consider eliminating or limiting their use in the kitchen. The counter tops and utensils should be washed with hot, soapy water between each step in food preparation. Proper cleaning reduces cross contamination through contact with different surfaces. Your hands are not the only thing that can transfer bacteria. Your hands should always be washed thoroughly with warm water and soap before working with food. It is also important to wash hands between different tasks. Proper thawing and cooking guidelines are essentials to preventing foodborne illnesses. Many species harbor Salmonella and other bacteria that make people sick. Proper thawing measures will greatly reduce the growth of these bacteria and proper cooking temperatures will kill the bacteria to safer levels. For the purpose of this article we are going to use turkey as an example. Raw turkey should be thawed in a refrigerator or in a place where the turkey will not get warmer than 41 degrees F. A 20 pound turkey will take about 3 days to thaw completely in a refrigerator. If the turkey is not completely thawed by time you are ready to begin cooking, it can be thawed under cold running water. Frozen turkey should not the thawed sitting out at room temperature or sitting in a sink full of water. Both practices cause rapid growth of bacteria. Before you begin cooking the turkey make sure to wash your hands. The only way to check if the turkey is safe to eat is to check if the turkey has reached the appropriate cooking temperature. 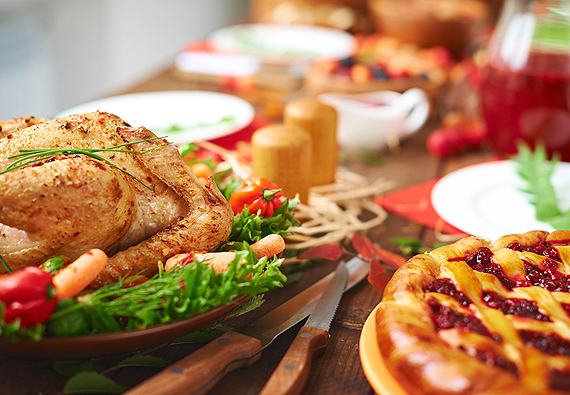 A turkey is generally considered safe to eat if it reaches on internal temperature of 180 degrees F. Those who are familiar with cooking temperatures for restaurants may recognize that this temperature is significantly higher. The difference allows for the varying degree of accuracy of home meat thermometers and equipment. When you take the internal temperature, make sure to check the thickest part of the turkey and check in multiple spots. Make sure to avoid fat and bone. After you are done with the thermometer, make sure to wash and rinse before storing. If you follow these three rules your holiday meals should be a success. The information in this article was taken from the Illinois Department of Public Health “Food Safety During the Holidays” handout. To read the handout in its entirety, please follow this link: Food Safety During the Holidays. The handout will also provide safe cooking temperatures for different meats, stuffing, and casseroles. If you have any questions, please contact the MCHD EH division.